These snack-sized treats are totally irresistible and are perfect way to celebrate this special occasion. 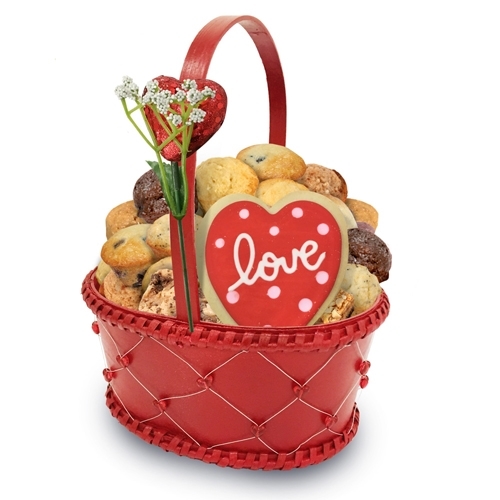 Our scrumptious mini muffins, mini cookies and mini brownies are a sure way to win someone's heart. Our baked to perfection goodies are a true indulgence. We send a charming split wood basket with red gem hearts tied with a beautiful heart and flower adornment filled with eighteen mini muffins in assorted delicious flavors, twelve scrumptious mini cookies and six of our decadently rich mini brownies in our most popular flavors. As well as a 4 inch decorated, heart shaped, frosted butter cookie. Of course, all goodies are individually wrapped for ultimate freshness. When all the treats are gone, they'll be sure to enjoy the elegant basket which is lined with plastic that doubles as a planter.This gift includes a free gift card.